Alloreactive T cells respond in a complex and sometimes unpredictable manner when transferred into an allogeneic environment. Following transfer, massive alloreactive T cell expansion is observed as well as extensive T cell anergy, apoptosis, and repertoire selection (1). There are many factors that control this complex behavior of alloreactive T cells and the pathological manifestations of their activities, graft-vs-host disease (GVHD).4 The outcome of the alloreactive T cell response is greatly influenced by the histocompatibility disparities between the donor and host, which can control the development of chronic vs acute GVHD (2). In addition, host conditioning (e.g., myeloablative drugs or irradiation) (3, 4, 5) can be a major contributing factor to whether alloreactive T cells differentiate, clonally expand, anergize, and/or undergo programmed cell death. While it is still not clear how host conditioning influences the development of the alloreactive response, it is believed that it may facilitate the maturity of endogenous APCs, thus affecting the capacity of the host to provide appropriate costimulation and cytokines to the developing alloreactive T cell response. Because the alloreactive T cell subset only represents a small percentage of the donor T cell population, and because this population is diverse in phenotype and function, visualization of their fate in an alloantigen-bearing host has been difficult. The use of TCR transgenic (Tg) T cells has allowed the visualization of Ag-specific T cell population dynamics and function in vivo. Previous attempts to develop a clinical model of GVHD using alloreactive Tg T cells have met with limited success. It has been reported that the transfer of anti-Ld (6, 7, 8) or anti-H-Y (9)-specific TCR Tg CD8+ Tg cells into Ag-bearing hosts results in the Tg T cells undergoing a short burst of expansion, followed by apoptosis and the development of anergy in the residual population. No overt GVHD was noted in these models. However, when cotransferred with a polyclonal T cell population, anti-Ld Tg T cell increased the severity of GVHD (8). Based on the previous data, our own studies (10), and those of others (7, 11), we hypothesized that the inability of the TCR Tg CD8+ T cells to mount an effective anti-host response was due at least in part to the lack of CD4 help. In this report we show that the co-adoptive transfer of alloreactive TCR Tg CD4+ T cells and TCR Tg CD8+ T cells into irradiated hosts results in the development of acute GVHD and death of the host, establishing the first TCR Tg model of acute GVHD. Using this model we can readily visualize alloreactive T cell expansion and differentiation and show that host conditioning by irradiation dramatically influences T cell function and fate. Upon transfer into non-irradiated hosts, the Tg T cells expand, condense, become anergic, and develop regulatory T cell activity. However, following transfer into non-lethally irradiated hosts, the Tg T cells expand and acquire potent effector functions, resulting in disease and death of the host. This novel system will allow a more incisive and comprehensive evaluation of how the host environment influences the development of alloreactive T cell responses during GVHD. 2C CD8+TCR Tg (12) mice were provided by Dr. D. Loh (Howard Hughes Medical Institute, St. Louis, MO). This TCR recognizes QLSPFPFDL (QL9) peptide bound to Ld (allogeneic). QL9 is derived from the enzyme 2-oxoglutarate dehydrogenase and belongs to the endogenous peptide repertoire of all H-2d APCs. TEa CD4+ TCR Tg mice (13) express a TCR that recognizes the peptide ASFEAQGLANIAVDKA in the context of I-Ab. This peptide correspond to positions 52–68 from the α-chain of I-E class II molecules and is expressed in all APCs from H-2b/I-E+ strains (B6 mice are I-E−, but their F1 hybrids with BALB/c are I-E+). The TEa Tg mice were bred to C57BL/6, congenic C57BL/6 CD45.1 (Ly5.2), or CD154−/− mice at the animal facility at Dartmouth Medical School (Lebanon, NH). OT-II CD4+ Tg mice were obtained from The Scripps Laboratories (San Diego, CA). This Tg TCR recognizes a peptide derived from OVA (positions 323–339) in the context of I-Ab. (BALB/c × C57BL/6)F1, C57BL/6 (B6), and congenic B6 CD45.1 (Ly5.2) mice were obtained from National Cancer Institute (Bethesda, MD). F1 recipient mice were exposed, or not, to a sublethal dose (650 cGy) of total body irradiation and then injected the same day i.v. with different combinations of Tg T cells (4 × 106). They were kept under standard housing in our animal facility with antibiotics in the drinking water. Mortality and other signs of disease (e.g., ruffled fur, hunched position, or lethargy) were monitored every other day during the next 2 mo. Animals judged to be moribund (i.e., unable to take food or water) were sacrificed and counted as dead by GVHD. Weight loss was monitored in some experiments every 5 days. Histological assessment of GVHD was performed on liver, colon, lung, and skin samples obtained on day 14 after transfer. The histological assessment was performed using a semiquantitative scoring system (0.5–4 grades) as shown below and based on previous reports (14):grade 0: normal; grade 0.5: minimal perivascular cuffing (liver, lung), and minimal infiltration in colon tissues; grade 1, perivascular cuffing, one to two cells in thickness, involving up to 15% of vessels (liver, lung); necrotic cells in up to 15% of crypts, minor infiltration of up to 20% of lamina propria (one to two cell thickness in intermucosal areas and submucosa; colon); grade 1.5: same as grade 1 plus infiltration into parenchyma proper (liver, lung) and minor infiltration of less than or equal to one third of the lamina propria (one to two cell thickness in intermucosal areas and submucosa; colon); grade 2: perivascular cuffing, two to three cells in thickness, involving up to 25% of vessels and infiltration into parenchyma proper (liver, lung); necrotic cells in ≤25% of crypts and three cell thickness in intermucosal areas and submucosa (colon); grade 2.5: perivascular cuffing, two to three cells in thickness, involving 25–50% of vessels and infiltration into parenchyma proper (liver, lung); necrotic cells in 25–50% of crypts, and three to four cell thickness in intermucosal areas and submucosa (colon); grade 3: perivascular cuffing, four to five cells in thickness, involving 25–50% of vessels, peribronchiolar cuffing (two to three cells), and infiltration into parenchyma proper (liver, lung); necrotic cells in >50% of crypts, infiltration of lamina propria (five to six cell thickness in intermucosal areas and submucosa) with loss of ≤25% of goblet cells (colon); grade 3.5: perivascular cuffing, six to seven cells in thickness, involving >50% of vessels, peribronchiolar cuffing (four to five cells; lung), necrotic foci (liver), and infiltration into parenchyma proper with severe disruption of structure (liver, lung); necrotic cells in >50% of crypts, infiltration of lamina propria resulting in displacement of ≤50% of mucosa with loss of 50% of goblet cells (colon); and grade 4: perivascular cuffing, more than eight cells in thickness, involving >50% of vessels, peribronchiolar cuffing (more than six cells, lung), large necrotic foci (liver), and infiltration into parenchyma proper with necrotic lesions (liver, lung); necrotic cells in <50% of crypts, infiltration of lamina propria resulting in displacement of >50% of mucosa with loss of 75–100% of goblet cells (colon). Survival data were analyzed using the Kaplan-Meier method, with the Wilcoxon rank test and the log-rank test used to verify the significance of the difference in survival between groups. A value of p < 0.05 was considered statistically significant. Spleen and lymph node cells from donor Tg mice were aseptically removed and teased into a single-cell suspension. 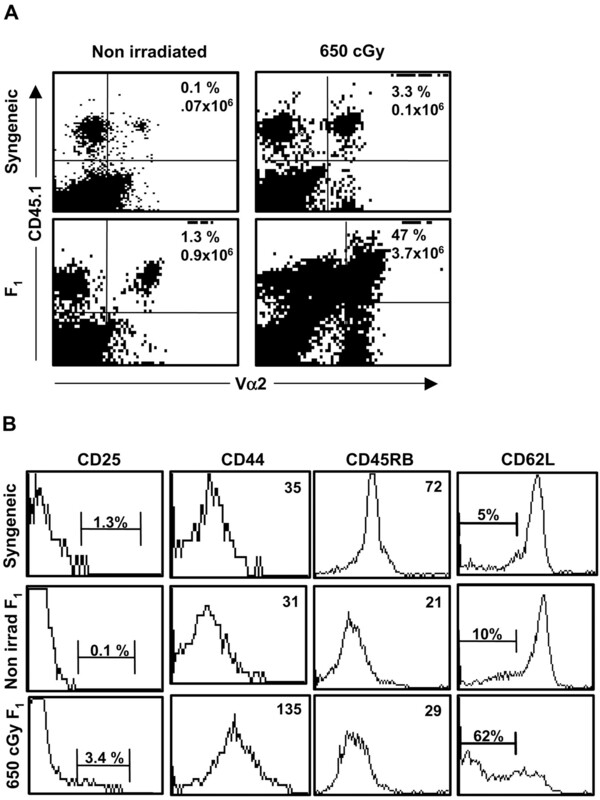 TEa CD4+ and/or 2C CD8+ Tg T cells (4 × 106/host) were injected into the tail vein of Ag-expressing F1 (H-2d/b) recipients or into syngeneic B6 hosts (H-2b). Some experimental groups received i.p. injections of αCD154 (MR1; 250 μg) on days 0 and 2 or of depleting αNK1.1 (PK136; 200 μg) on days −3, 0, and 3 after adoptive transfer. To follow the expansion and phenotype of the transferred Tg T cells, lymphocytes from recipient spleens were harvested at different times and analyzed by flow cytometry. The 2C CD8+ Tg cells were identified using conjugated idiotypic mAb 1B2 (provided by H. N. Eisen, Massachusetts Institute of Technology, Cambridge, MA) in double staining with αCD8 (BD PharMingen, San Diego, CA). The TEa CD4+ Tg cells were identified with αVα2 or αVβ6 and additionally αDd (negative marker) or αCD45.1 (Ly 5.2) as donor markers to exclude the endogenous Vα2+/Vβ6+ cells from the F1 host mice. αCD62L-, αCD45RB-, αCD25-, and αCD44-conjugated mAb (BD PharMingen) were used in multicolor flow cytometry to determine the phenotype of the Tg T cells after adoptive transfer. Samples were run on a FACSCalibur flow cytometer, and data were analyzed using CellQuest software (BD Biosciences, Mountain View, CA). Dead cells were excluded based on forward and side light scatters. Spleen cells from F1 animals that had been transferred with 2C CD8+ Tg mouse cells were used as effectors in a CTL assay taken directly ex vivo (without further rechallenge in vitro). P815 (H-2d) cells stably transfected with bacterial β-galactosidase (15) (provided by Dr. Schafer, Robert Koch Institute, Berlin, Germany) were used as target cells. The specific CTL activity of the 2C cells was assessed by measuring enzymatic β-galactosidase activity (15) released to the supernatants in an 8- to 18-h culture using a luminescent assay (Galactolight, Tropix, Bedford, MA). Allotype-marked (CD45.1+) Tg TEa CD4+ cells were isolated from F1 hosts after 4–5 days by positive selection using biotinylated αCD45.1, followed by incubation with streptavidin-conjugated magnetic beads (Miltenyi Biotech, Auburn, CA) according to the manufacturer’s instructions. The purity of recovered TEa CD4+ Tg cells was between 70 and 90%. The isolated primed TEa CD4+ cells were then cultured with fresh F1 cells in 96-well plates at a final density of 5 × 105/well. The number of stimulator F1 cells added was adjusted so that the percentage of responder TEa CD4+ Tg cells was the same in all groups. After 48-h culture, supernatants were collected and subsequently assayed for IL-2, IFN-γ, IL-10, IL-4, or TGF-β by sandwich ELISA with unconjugated and biotinylated α-cytokine mAb pairs obtained from BD PharMingen. To quantify proliferation, MLR cultures were incubated during a total of 72 h, the last 18 h they were pulsed with 1 μCi/well of [3H]TdR, and proliferation was measured in a scintillation counter (Packard, Meriden, CT). For some experiments Tg T cells were labeled with the intracellular fluorescent dye 5(and 6)-carboxyfluorescein diacetate succinimidyl ester (CFDASE) obtained from Molecular Probes (Eugene, OR). Then the cells were recovered and assayed by multicolor flow cytometry gating in the Tg cell population of interest to detect the dilution of the dye caused by cell proliferation. Thus, every successive cellular generation exhibits a 50% decrease in the intensity of CFDASE fluorescence. All dye dilution data were analyzed with ModFit LT software (16) (Verity Software House, Topsham, ME), which models the number of divisions (Gn) that the cells have undergone given the fluorescence intensity of a parental (P) nonproliferating population. A model of acute GVHD has been developed that is mediated by the co-adoptive transfer of alloreactive TEa CD4+ TCR Tg (recognizing I-Eα 52–68 peptide in the context of I-Ab) and 2C CD8+ TCR Tg (recognizing Ld) cells into alloantigen-bearing (BALB/c × C57Bl/6)F1 hosts (referred to hereafter as F1). The results show that conditioning of the host by sublethal irradiation (650 cGy) before the transfer of the alloreactive Tg T cells is essential for the induction of clinical acute GVHD. Thus, the cotransfer of TEa CD4+ and 2C CD8+ Tg T cells into non-irradiated F1 recipients did not induce apparent clinical signs of GVHD, such as hunched posture and ruffled fur (Fig. 1⇓A) or weight loss (Fig. 1⇓B), which were clearly apparent in irradiated F1 recipients (Fig. 1⇓, A and B). Most important, >95% of irradiated F1 recipients died of GVHD (mean survival time, 19 days), while all nonirradiated F1 recipients survived (p < 0.0005; Fig. 2⇓). Concordant with these clinical observations, the histological examination of sections of lung, liver, colon, and skin (obtained on day 14 after Tg T cell transfer) demonstrated a higher pathology score (using a semiquantitative GVHD scoring system) in irradiated than in non-irradiated F1 recipients (Fig. 1⇓C). Irradiated F1 hosts are susceptible to acute GVHD induced by Tg T cells. A, Clinical appearance of representative F1 mice 14 days after receiving an i.v. injection of 2C CD8+ (4 × 106 cells) and TEa CD4+ Tg cells (4 × 106 cells). The upper panel shows a non-conditioned mouse with no apparent signs of acute GVHD. The lower panel shows a mouse conditioned with 650 cGy before receiving Tg T cells, showing weight loss and ruffled fur. B, F1 mice received 650 cGy (▪ and □) or were not treated (• and ○) and were injected the same day i.v. with 2C CD8+ and TEa CD4+ Tg cells (▪ and •) or did not receive alloreactive 2C CD8+ and TEa CD4+ Tg cells (□ and ○). Weight was monitored every 5 days. There were six mice per group. C, F1 mice were sublethally irradiated with 650 cGy (▪) or were not treated (□) as indicated and were injected the same day with 2C CD8+ and TEa CD4+ Tg T cells. Fourteen days later they were sacrificed, and sections of liver, colon, lung, and skin were analyzed using a semiquantitative (0.5–4 grades) GVHD pathology scoring system. Data in B and C were analyzed using two-tailed Student’s t test. Error bars represent SDs, and asterisks denote significant values (p < 0.005). CD4+ and CD8+ Tg cells synergize in a CD40-dependent fashion in the induction of lethal GVHD in irradiated F1 hosts. F1 mice received 650 cGy, or not, as indicated, and they were injected the same day i.v. with 2C CD8+ (4 × 106 cells/mouse), TEa CD4+ Tg cells (4 × 106 cells/mouse), or both as indicated. Some groups were treated with blocking αCD154 mAb (250 μg; days 0, 2, 4, after adoptive transfer) as indicated. The mortality of the recipient mice was tracked during the next 60 days. There were 18–24 mice/group. In addition to some mild tissue infiltration (not shown) and pathology (Fig. 1⇑C), the combined transfer of both Tg populations into non-irradiated recipients caused a transient depletion of circulating host B cells by 2 wk after transfer (not shown). However, all animals recovered normal levels of B cells spontaneously by 6 wk after transfer (not shown), and they survived for >2 mo without showing any other clinical signs of GVHD. In summary, conditioning of the host by sublethal irradiation enabled the development of lethal GVHD mediated by alloreactive TCR Tg T cells. In contrast, the transfer of TCR Tg T cells into non-irradiated hosts caused a subclinical disease. Next we studied the differential contributions of the CD4+ and CD8+ Tg T cell subsets in the induction of the acute GVHD lethality. Maximal mortality was observed (>95% of the F1 hosts) when both TEa CD4+ and 2C CD8+ Tg cells were transferred (Fig. 2⇑). The synergistic effect of 2C CD8+ and TEa CD4+ Tg cells in inducing the mortality of the host was dependent on intact CD40-CD154 interactions, since a brief treatment (days 0, 2, and 4 after transfer) with blocking αCD154 mAb was sufficient to protect a significant fraction of the recipients (p < 0.005). Nevertheless, 50% of the αCD154-treated mice died (Fig. 2⇑), similar to what was observed in non-Tg models of GVHD using irradiated recipients (17). Expression of CD154 on the TEa CD4+ Tg cell appeared critical, as demonstrated by the observation that CD154−/− TEa CD4+ Tg cells did not synergize with 2C CD8+ Tg cells in the induction of disease (not shown). The transfer of TEa CD4+ Tg cells alone caused death in ∼60% of the hosts. This mortality was not significantly affected (p = 0.2) by treatment with αCD154 mAb (Fig. 2⇑). In contrast to the lethality seen with TEa CD4+ Tg cells alone, the transfer of only the 2C CD8+ Tg cells caused death in only 18% of the mice, and these deaths occurred at a later time point (mean survival time, 38 days) than in the groups co-transferred with both Tg populations (p < 0.005) or with TEa CD4+ Tg cells alone (Fig. 2⇑). To gain insights into the cellular basis for GVHD development, the in vivo proliferation and differentiation of the 2C CD8+ Tg T cell populations in irradiated and non-irradiated F1 mice was determined. Four days following adoptive transfer, the 2C CD8+ Tg in non-irradiated F1 recipients expanded >6-fold in 2C CD8+ Tg cells transferred to syngeneic B6 controls (Fig. 3⇓A). This expansion in vivo of the 2C CD8+ Tg T cells was enhanced 2–3 times upon co-transfer with TEa CD4+ Tg T cells, and this effect was dependent on CD154-CD40 interactions, which were prevented by treatment with blocking αCD154 mAb (Fig. 3⇓A). Twelve days after adoptive transfer, the CD154-dependent TEa CD4+ enhancement of the 2C CD8+ expansion was even more marked (not shown), confirming our previous findings (10) obtained using polyclonal CD4+ T cell help. 2C CD8+ Tg cell function depends on CD4+ help and intact CD40 signaling. A, Non-irradiated (upper row) or sublethally irradiated (lower row) recipient F1 or syngeneic B6 mice were injected with 2C CD8+ Tg cells. Some groups were co-injected with TEa CD4+ Tg cells as a source of help and treated, or not, as indicated with blocking αCD154 mAb. Four days later recipient animals were sacrificed, and spleen suspensions were analyzed by flow cytometry using the α-clonotypic mAb 1B2 and αCD8. Dot plots correspond to a pool of two or three mice and are representative of at least three different experiments. The percentage of 2C CD8+ Tg cells and the corresponding total number per spleen are indicated. B, Non-irradiated or sublethally (650 cGy) irradiated F1 recipients were injected with 2C CD8+ Tg cells. Some groups were co-injected with TEa CD4+ Tg cells as a source of help and treated, or not, as indicated with blocking αCD154 mAb. 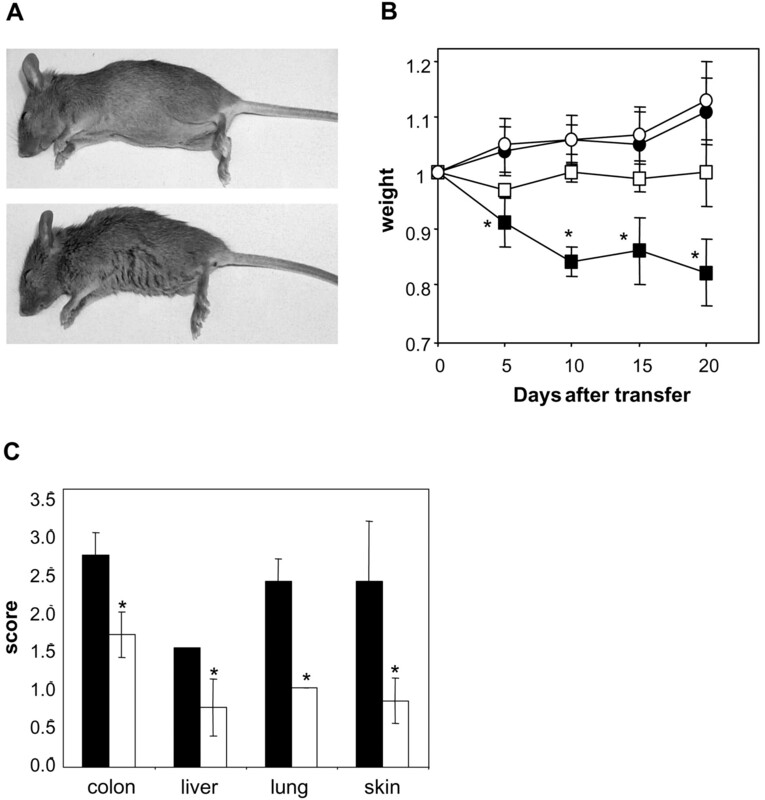 Four days later recipient animals (three mice per group) were sacrificed, and spleen cell suspensions were pooled and directly assayed (without rechallenge in vitro) for CTL activity on P815 target cells. The percentage of 2C Tg T cells in each cell suspension was adjusted to an equivalent number by adding fresh F1 cells. The mean fluorescence intensity of the total TEa CD4+ population or the percentage of positive cells is indicated in each panel. Data presented are representative of three individual experiments. 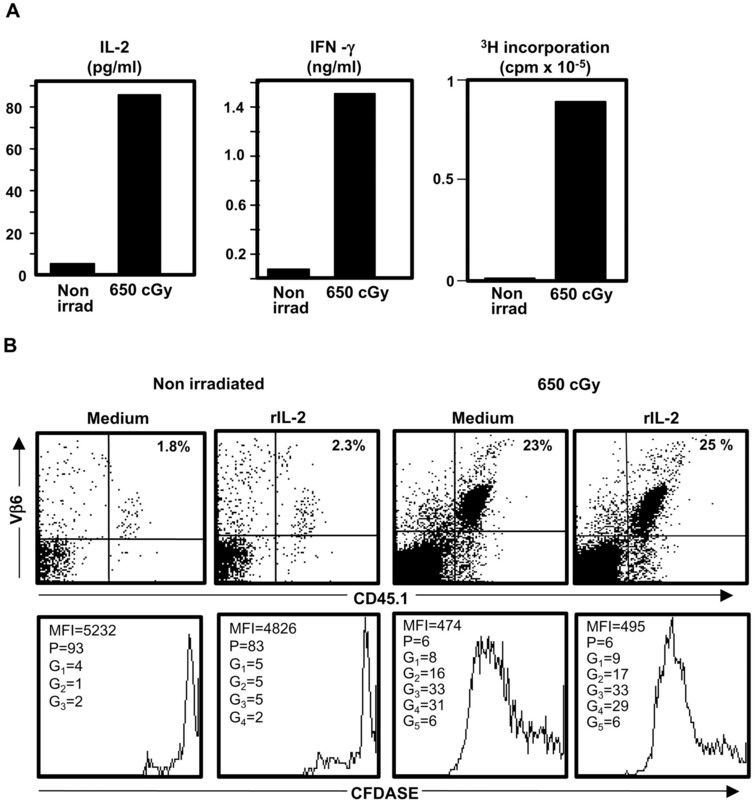 In contrast to the transfer to non-irradiated hosts, transfer of 2C CD8+ Tg T cells into irradiated F1 hosts caused more extensive CD8+ Tg T cell expansion (28-fold with respect to the transfer into irradiated syngeneic B6 mice) even in absence of TEa CD4+ Tg help and intact CD40-CD154 signaling (Fig. 3⇑A). The total number of CD8+ Tg T cells per spleen in the irradiated mice was >7 times greater than that in the non-irradiated mice (Fig. 3⇑A). Hence, the environment in the irradiated mice was far more supportive of expansion of the 2C CD8+ Tg cell population. The development of CTL activity by the 2C CD8+ Tg cells after in vivo priming was measured in both irradiated and non-irradiated F1 recipients. Following expansion in vivo, each of the effector cell suspensions was adjusted so as to normalize for the number of 2C CD8+ Tg cells. On a per cell basis, the 2C CD8+ Tg cells primed in non-irradiated F1 hosts failed to produce detectable CTL activity over basal levels with or without TEa CD4+ Tg help (Fig. 3⇑B). This finding correlates well with the clinical data showing the resistance of non-irradiated F1 hosts to acute GVHD induced by Tg T cells. Interestingly, while the TEa CD4+ Tg cells appeared nonessential for 2C CD8+ Tg T cell expansion in irradiated hosts, TEa CD4+ Tg cells and functional CD154 signaling were essential for the development of CD8+-mediated cytotoxicity (Fig. 3⇑B). These results correlate well with the CD154-dependent development of clinical disease in irradiated hosts. The data suggest that CD154+, TEa CD4+ Tg T cells contribute to lethality in the irradiated F1 hosts by enhancing the differentiation of the 2C CD8+ Tg T cells to become effector CTL. The observation that TEa CD4+ Tg T cells caused lethal GVHD and were able to dispense help to Tg CD8+ cells in irradiated, but not in non-irradiated, hosts suggests that the behavior of these cells may also be significantly altered in these differing host environments. Thus, the in vivo expansion and effector function of the TEa CD4+ Tg cells transferred into irradiated and non-irradiated F1 mice were also determined. Four days after adoptive transfer, the expansion of TEa CD4+ Tg cells was substantially higher in irradiated Ag bearing F1 recipient spleens, as assessed both as a percentage (47% in irradiated F1 vs 1.3% in non-irradiated F1 hosts) and as the absolute number per spleen (3.7 × 106 in irradiated vs 0.9 × 106 in non-irradiated F1 hosts; Fig. 4⇓A). Nevertheless, 13 times more TEa CD4+ Tg cells were detected in non-irradiated F1 than in syngeneic B6 recipients (Fig. 4⇓A). Twelve days after adoptive transfer, TEa CD4+ Tg cells were barely detectable in non-irradiated recipient spleens (not shown). TEa CD4+ Tg cells expand, but fail to acquire the full activation phenotype, after adoptive transfer into non-irradiated F1 hosts. A, F1 (lower row) or syngeneic B6 (upper row) mice were irradiated, or not, as indicated and injected the same day with 4 × 106 TEa CD4+ Tg cells. Four days later recipient animals were sacrificed, and spleen suspensions were analyzed by flow cytometry using anti-Vα2 and the donor marker CD45.1 to track TEa CD4+ Tg cells. Dot plots correspond to a pool of three mice and are representative of at least three different experiments. The percentage of TEa CD4+ Tg cells and the total number per spleen are indicated in each dot plot. B, Non-irradiated or 650 cGy irradiated F1 or syngeneic B6 recipients were injected i.v. with TEa CD4+ Tg cells as indicated. Four days later recipient animals were sacrificed, and spleen suspensions were analyzed by flow cytometry to track the phenotype of TEa CD4+ cells with the T cell activation markers CD62L, CD25, CD44, and CD45RB as indicated. Histograms present gated double-positive Vα2/CD45.1 from a pool of three spleens per group and are representative of three different experiments. To evaluate the possibility that the limited expansion of CD4+ TEa Tg cells in non-irradiated recipients was due to hybrid resistance mediated by radiosensitive NK cells, we treated F1 recipients with the depleting αNK1.1 mAb clone PK136 on days −3, 0, and 3 after transfer of TEa CD4+ Tg cells. Results obtained show that this treatment did not influence the expansion of TEa CD4+ Tg cells in F1 recipients (data not shown). These data suggest that hybrid resistance does not play an important role in regulating the expansion of Tg T cell populations in this experimental GVHD model. In addition to evaluating the expansion of TEa CD4+ Tg T cells, Tg T cell activation was assessed by monitoring the expression of T cell surface activation markers. Interestingly, TEa CD4+ Tg cells transferred into non-irradiated F1 hosts failed to up-regulate CD44 or CD25 (Fig. 4⇑B) or down-regulate CD62L (Fig. 4⇑B). In fact, the phenotype of the TEa CD4+ Tg cells that expanded in the non-irradiated host is identical with that exhibited by naive TEa CD4+ Tg cells (Fig. 4⇑B), with the exception of a down-regulation of the expression of CD45RB (Fig. 4⇑B). In contrast, TEa CD4+ Tg cells transferred into irradiated F1 hosts showed a robust activation phenotype, with marked up-regulation of CD25 and CD44 (Fig. 4⇑B) and down-regulation of CD62L and CD45RB. Treatment with blocking αCD154 mAb did not alter the expansion and up-regulation of activation markers on TEa CD4+ Tg cells in vivo (not shown). The results presented above suggested that the development of effector functions of the TEa CD4+ Tg T cells might be markedly impaired in the non-irradiated host. To test this possibility, the capacity of TEa CD4+ Tg cells isolated from irradiated and non-irradiated hosts to mount recall responses in vitro was determined. All rechallenge cultures were performed such that the percentage of responder TEa CD4+ Tg cells in all cultures was identical. After priming in irradiated F1 hosts, TEa CD4+ Tg cells proliferated upon rechallenge in vitro and produced substantial amounts of IL-2 and IFN-γ in vitro (Fig. 5⇓A). In contrast, TEa CD4+ Tg T cells primed in non-irradiated F1 recipients did not secrete detectable amounts of either cytokine in these in vitro rechallenge assays (Fig. 5⇓A), nor did they proliferate, as measured by thymidine incorporation (Fig. 5⇓A). In addition, the production of IL-4, IL-10, and TGF-β was also measured following rechallenge in vitro. The TEa CD4+ Tg cells primed in non-irradiated F1 hosts failed to produce detectable levels of any of these cytokines, whereas the TEa CD4+ Tg T cells primed in irradiated recipients secreted high levels of IL-10, but not IL-4 nor TGF-β (not shown). 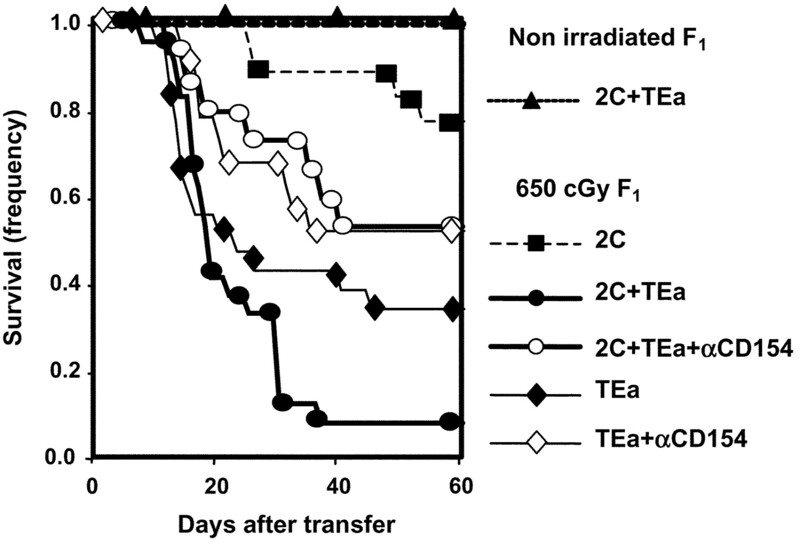 TEa Tg CD4+ Tg cells become anergic upon adoptive transfer into non-irradiated F1 hosts. A, F1 mice were irradiated (650 cGy), or not, and injected the same day i.v. with TEa CD4+ Tg cells. Four days later Tg cells were recovered from both groups (three mice per group) and cultured with fresh F1 cells. The number of stimulator F1 cells added was adjusted so that the number of responder TEa cells was the same in all cultures. Culture supernatants were taken 2 days later and assayed for IL-2 and IFN-γ by ELISA. Parallel cultures were harvested after 72 h, the last 18 h pulsed with [3H]TdT, and proliferation was measured. B, The same cell suspensions obtained after 4 days of adoptive transfer were labeled with the fluorescent cytoplasmic dye CFDASE and cultured for 4 days with or without 20 ng/ml of rIL-2 added to the culture medium. Then they were analyzed by multicolor flow cytometry to track the proliferation of the TEa CD4+ Tg (Vβ6/CD45.1+) cells by dilution of the dye. MFI, mean fluorescence intensity of total TEa CD4+ population; P, percentage of non-dividing cells; Gn, percentage of cells that underwent n divisions. The data presented in A and B are representative of three individual experiments. The lack of proliferative ability of TEa CD4+ Tg cells primed in non-irradiated F1 hosts was confirmed by in vitro CFDASE dilution. Less than 10% of the TEa CD4+ Tg cells from non-irradiated hosts underwent cell division (Fig. 5⇑B), whereas >90% of the TEa CD4+ Tg cells from irradiated hosts proliferated with ∼40% of them going through more than four cell divisions in vitro (Fig. 5⇑B). The lack of cell division of the TEa CD4+ Tg cells from non-irradiated hosts appeared to only be marginally restored by exogenous IL-2 (Fig. 5⇑B). Thus, the TEa CD4+ Tg T cells isolated from non-irradiated hosts had a severely limited capacity to proliferate, and this deficiency was not due to the lack of available IL-2. In summary, these results show that following adoptive transfer into non-irradiated F1 hosts, TEa CD4+ Tg cells are unable to acquire a complete activation phenotype and are anergic in vitro with respect to the production of Th1 cytokines and proliferation. All these characteristics are in contrast with those exhibited by TEa CD4+ Tg cells primed in sublethally irradiated F1 hosts, where the acquisition of an activation phenotype and cytokine production by the TEa CD4+ Tg cells correlates well with their capacity to induce GVHD. A number of reports have shown that T cells that acquire an anergic phenotype also manifest regulatory/suppressive activity (18, 19, 20). To test for regulatory activity of the anergic TEa CD4+ Tg cells, congenic CD45.1+ TEa CD4+ Tg cells (isolated from non-irradiated F1 mice) were cocultured (at a ratio of 5:1) with CFDASE-labeled, CD45.2− naive TEa CD4+ Tg cells in the presence of F1 cells as APC. After 4 days of culture, the extent of naive TEa CD4+ Tg cell proliferation was assessed by the dilution of CFDASE dye. The results establish that purified regulatory TEa CD4+ Tg cells can reduce the expansion of the naive TEa CD4+ Tg cells (Fig. 6⇓A). Upon analysis, 33% of the naive TEa CD4+ Tg cells from cultures containing regulatory TEa CD4+ Tg cells underwent less than three cell divisions, while only 10% of the naive TEa CD4+ Tg cells from cultures containing no regulatory cells did the same. The reduction in total cell divisions manifests as the percentage of naive TEa CD4+ Tg cells that accumulate in the cultures after 4 days. Consequently, after undergoing three to seven cell divisions, the naive TEa CD4+ Tg cells accumulate in the control cultures up to 42% of the total cell number, while in cultures containing regulatory TEa CD4+ Tg cells, the naive cells only represent 14% of the total cells. The regulatory activity in vitro of TEa CD4+ Tg primed in non-irradiated F1 hosts is Ag specific. A, Regulatory TEa CD4+ Tg cells suppress the expansion of naive TEa CD4+ Tg cells. Naive TEa CD4+ Tg cells were labeled with CFDASE and then cultured (105/well) in MLR with 4.5 × 106 T cell-depleted stimulator cells from F1. Some cultures received 5 × 105 regulatory TEa CD4+ Tg cells that had been re-isolated by positive magnetic bead selection after priming in non-irradiated F1 hosts. After 4 days of culture cells were analyzed by four-color flow cytometry. Histograms represent CFDASE dye dilution of the TEa CD4+ Tg naive population defined as gated CD4+ Vβ6+ (the regulatory TEa CFDASE−/CD45.1+ cells are gated out). MFI, mean fluorescence intensity of total gated TEa CD4+ naive population; P, percentage of non-dividing cells; Gn, percentage of cells that underwent n divisions. B, Regulatory TEa CD4+ Tg cells do not suppress the expansion of OVA-specific OT-II CD4+ Tg. Naive OT-II CD4+ Tg cells were labeled with CFDASE and then cultured (105/well) with 4.5 × 106 T cell-depleted stimulator cells from F1 in the presence of 100 μg/ml of OVA peptide. Some cultures received 5 × 105 regulatory TEa CD4+ Tg cells that had been re-isolated by positive magnetic bead selection after priming in non-irradiated F1 hosts. After 4 days of culture cells were analyzed by four-color flow cytometry. MFI, mean fluorescence intensity of total gated OT-II CD4+ Tg naive population; P, percentage of non-dividing cells; Gn, percentage of cells that underwent n divisions. A and B represent results obtained in three separate experiments. We next established whether the suppressive effect of the regulatory TEa CD4+ Tg cells was Ag specific. To that end, naive OT-II CD4+ Tg T cells (specific for OVA323–339 peptide) were labeled with CFDASE and cultured in the presence of Ag and regulatory TEa CD4+ Tg cells. As assessed by dye dilution, these regulatory TEa CD4+ cells were unable to suppress OVA-induced proliferation or alter the percentage of OT-II CD4+ Tg cells (Fig. 6⇑B) present in the population after 4 days of culture. To verify whether the regulatory TEa CD4+ Tg activity was also manifested in vivo, congenic CD45.1+, TEa CD4+ Tg T cells that had been primed in non-irradiated hosts were co-transferred with naive 2C CD8+ Tg T cells and TEa CD4+ Tg cells (non-congenic for CD45.1, which allows us to differentiate the individual cell populations after co-transfer). The cell ratio of regulatory to naive cells was 1:1. The co-transfer of regulatory TEa CD4+ Tg cells reduced naive TEa CD4+ Tg T cell expansion nine times compared with that observed in their absence (from 0.9 × 106 to 0.1 × 106/spleen; Fig. 7⇓A). The inhibition of the expansion of naive 2C CD8+ Tg T cells was even more marked (from 2 × 106 to 0.1 × 106/spleen). A, TEa CD4+ Tg cells suppress the expansion of naive Tg cells in vivo after being primed in non-irradiated F1 hosts. Secondary 650 cGy irradiated F1 hosts were injected with 4 × 106 2C CD8+ and 4 × 106 TEa CD4+ Tg naive cells together with TEa CD4+ CD45.1+ congenic cells that had been primed for 4 days in vivo in primary non-irradiated F1 mice. The control group (first column) received only the naive TEa CD4+ Tg and 2C CD8+ Tg T cells. Four days after the secondary transfer spleen cell suspensions were obtained and analyzed by flow cytometry. The readout TEa Tg population was defined as Dd− Vα2+ CD45.1−. The CD45.1+ (regulatory) TEa cells were gated out. 2C CD8+ T cells were detected with the clonotypic mAb 1B2 and αCD8 (second row). Dot plots correspond to a pool of three mice and are representative of two different experiments. The percentage of Tg cells and the corresponding total number per spleen are indicated in each dot plot. B, TEa CD4+ Tg cells suppress the development of acute GVHD after being primed by non-irradiated hosts. Secondary 650 cGy irradiated F1 hosts were injected with naive 2C CD8+ and TEa CD4+ Tg cells together with TEa CD4+ cells that had been primed for 4 days in vivo in primary non-irradiated F1 mice. Control group received only the naive TEa CD4+ Tg and 2C CD8+ Tg T cells. The mortality of the recipient mice was followed during the next 60 days. There were 15–20 mice/group. Finally, we addressed the clinical significance of the suppressive capacity of the regulatory TEa CD4+ Tg cells in GVHD. To that end, regulatory TEa CD4+ Tg cells and naive TEa CD4+ and 2C CD8+ Tg T cells were transferred into irradiated F1 mice (at a ratio of one regulatory to one naive), and the course of GVHD was followed. The results showed a significant protection (p < 0.005) against the disease. Thus, 70% of the animals that received regulatory TEa CD4+ Tg and naive Tg cells survived, whereas only 5% of the control animals (that received only naive 2C CD8+ and TEa CD4+ Tg cells) survived (Fig. 7⇑B). In summary, TEa CD4+ Tg cells that are induced to expand in non-irradiated F1 hosts cannot mount an effective alloreactive response, are rendered tolerant, and acquire regulatory activity. This activity is manifested by the ability of the regulatory TEa CD4+ cells to suppress the expansion of naive Tg T cells as well as to prevent the development of clinical GVHD. The data presented in this report show that host conditioning exerts a profound impact on alloreactive T cell fate and the capacity of alloreactive T cells to cause GVHD. The transfer of alloreactive T cells into irradiated recipients induced lethal GVHD, whereas the transfer into non-irradiated recipients resulted in the absence of clinical disease, T cell anergy, and suppression. The use of this TCR Tg T cell approach has provided novel insights into the behavior of alloreactive T cells in an alloantigen-bearing environment. Total body irradiation (TBI) is a classical method for host conditioning before bone marrow transplantation. While TBI is necessary to improve engraftment and eliminating leukemic cells, little is known about how it influences alloreactive T cell behavior. It is known that TBI increases the susceptibility to GVHD and, additionally, worsens the clinical severity in experimental models (3, 5, 19, 20). However, it is possible to induce acute GVHD in non-irradiated F1 recipients using a high number of polyclonal non-Tg T cells (19, 20). We postulate that the different behaviors of Tg and polyclonal T cells in non-irradiated recipients might be related to the different spectra of affinities and specificities (against major and minor histocompatibility Ags) that polyclonal T cells possess vs the expression of a single high affinity TCR in the Tg cells. TBI induces a marked burst of production of inflammatory cytokines such as TNF-α, IL-6, and IL-1 (3, 4). Additionally, the gut damage caused by irradiation allows the release of LPS from the intestinal flora (5), which can induce a wide range of secondary inflammatory actions. We postulate that this proinflammatory milieu enhances host APC maturation, which heightens their ability to activate alloreactive T cells. In addition to the effects on the APC compartment, it has been postulated that irradiation could ablate host regulatory T cell populations (19, 20) and create space in the hemopoietic organs, triggering Ag-independent homeostatic expansion of T cells (21). The study presented greatly extends our knowledge of the role that CD4+ T cells play in controlling the fate and function of CD8+ T cells in GVHD. The 2C CD8+ Tg T cells transferred alone into Ag-bearing F1 hosts expanded, but were inefficient at inducing GVHD even in irradiated hosts. Thus, TBI created an environment favorable to a greater expansion of 2C CD8+ Tg T cells, but by itself was not able to support the development of CTL activity. The reduced ability of CD8+ cells to induce lethal GVHD has been reported previously using polyclonal CD8+ T cells (22) and 2C CD8+ Tg T cells (7, 8). In an attempt to divert the fate of the 2C CD8+ Tg cells from anergy to functional responsiveness, CD4+ TEa Tg cells were co-transferred as a source of help. The induction of lethal GVHD and the development of high levels of CTL activity occurred only when TEa CD4+ and 2C CD8+ Tg T cells were co-transferred to irradiated F1 hosts. Therefore, both CD4+ T cell help and irradiation were essential to overcome the lack of functional response of the 2C CD8+ Tg cells in vivo. Interestingly, the acquisition of CTL activity and the heightened lethality by 2C CD8+ Tg cells were dependent upon intact CD154/CD40 signaling. We (10) and others (23, 24, 25, 26) have suggested that CD154-induced maturation of host dendritic cells may be a critical event inducing CTL responses. However, we cannot distinguish in our model the relative contributions of the TBI-mediated inflammatory effects acting directly on the 2C CD8+ Tg cells enhancing their differentiation vs the indirect effects acting on the TEa CD4+ Tg cells promoting their effector function and thus enabling them to dispense help to the 2C CD8+ T cells. The balance of anergy vs activation in the alloreactive TEa CD4+ Tg subset is greatly influenced by host conditioning. In addition to enabling the development of CTL activity by the 2C CD8+ Tg, the TEa CD4+ Tg cells alone can induce lethal disease in a substantial fraction of the irradiated hosts. In contrast, the TEa CD4+ cells transferred to non-irradiated F1 recipients became profoundly anergic after undergoing several rounds of cell division in vivo. The CD4+ T anergized in vivo by injection of soluble peptide behave similarly (27). The profound unresponsiveness induced in the TEa CD4+ Tg cell population may be due to the combined effects of high Ag density on host APCs and the expression of a high affinity TCR on the TEa CD4+ Tg cells (28). Nonetheless, irradiation can sufficiently alter the host environment, leading to APC maturation and the induction of T cell effector function. Anergy can be classified by its reversibility and its association with suppression. The anergy induced in TEa CD4+ Tg T cells from non-irradiated F1 hosts is not reversed by addition of exogenous IL-2. This is similar to systems in which anergy was induced in vivo after injection of superantigens (29) or in mice treated with αCD4 mAb (30) in which IL-2 could not effectively reverse the unresponsiveness. On the other hand, observations with the anergized TEa CD4+ Tg T cells are unlike the unresponsiveness of T cell clones anergized in vitro by the absence of costimulation, which is typically reversed by exogenous IL-2 (18, 31). Furthermore, induction of anergy in the TEa CD4+ Tg cell population is associated with the acquisition of a regulatory activity exerted on naive Tg cells. The linkage of anergy and suppression has been demonstrated in some systems (18, 32, 33), but not in others (34, 35). The data presented in this study show that TEa CD4+ Tg cells primed in non-irradiated hosts suppress upon secondary transfer the expansion of naive alloreactive Tg T cells and reduce their ability to induce clinical GVHD. This indicates that the commitment to a regulatory phenotype is irreversible even in the permissive proinflammatory environment present in secondary irradiated hosts. Correlating with their in vivo function, the TEa CD4+ Tg cells primed in non-irradiated host are able to exert a suppressive activity on the proliferation of naive TEa CD4+ Tg cells. The addition of conditioned supernatants from activated regulatory cells to these cultures is not able to reproduce this regulatory effect on naive cells (data not shown), which suggests that a mechanism requiring cellular contact may be operative. Consistent with this conclusion is the finding that supernatants conditioned by regulatory TEa CD4+ Tg cells lack detectable amounts of the regulatory cytokines IL-10 and TGF-β. The regulatory activity is specific for alloreactive Tg responses, as indicated by the finding that regulatory TEa CD4+ Tg are unable to exert any effect on the OVA-driven response of Ag-specific OT-II CD4+ Tg cells. While establishing the mechanism of suppression at a molecular level would require further experimental work, our data suggest that the regulatory activity could be mediated by influencing the APCs by a cell contact-mediated mechanism. Recent studies have shown that there is a CD25+/CD4+ cell subset generated by the thymus (35) committed to exert suppressor activity on TCR stimulation. TCR Tg mice on the recombinase-activating gene−/− background are deficient in these cells (36, 37), which may suggest that their differentiation requires endogenous TCR-α rearrangement (37). In addition, the anergy of CD25+/CD4+ T cells is overridden in vitro by IL-2 (36, 37, 38), but the anergy of TEa CD4+ Tg T cells is not. Furthermore, <1% of naive TEa Tg T cells are CD25+. While these cells may play a regulatory role, we postulate that the TEa CD4+ Tg regulatory activity is probably induced de novo as a consequence of Ag recognition in the periphery in non-permissive conditions and is not associated with a “professional” regulatory subset. In other transplantation models the development of a regulatory activity has been observed when alloreactive T cells are transferred under tolerogenic conditions (33, 39). In conclusion, this study describes the development of a new system that allows visualization of the dynamic changes in magnitude and function of alloreactive CD4+ and CD8+ T cell populations in vivo. The findings underscore the importance of host conditioning in controlling the fate of alloreactive cells. While the Tg T cell behavior observed in this system may not portray all components of the alloreactive polyclonal T cell response, it provides insights into how Ag dose, costimulation, and the inflammatory environment can control T cell expansion and differentiation. We thank Brigit Durell for her excellent technical assistance. Flow cytometry was performed at Dartmouth Medical School in the Herbert C. Englert Cell Analysis Laboratory with the technical assistance of Gary Ward and Dr. Alice Givan. ↵1 This work was supported by National Institutes of Health Grants R01AI34495, 2R37HL56067, R01HL63452, P01AI-35225, and CA82542. ↵2 M.G. and S.A.Q. contributed equally to this work. ↵4 Abbreviations used in this paper: GVHD, graft-vs-host disease; CFDASE, 5(and 6)-carboxyfluorescein diacetate succinimidyl ester; TBI, total body irradiation; Tg, transgenic.